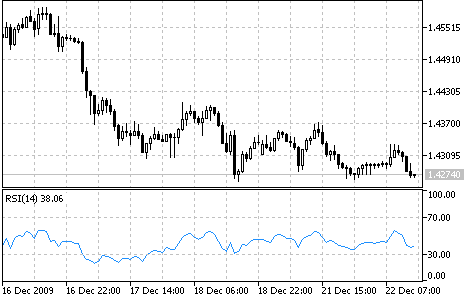 RSI - indicator for MT 4 - Find the best Binary Options Brokers, Binary Options Bonuses, Binary Options Signals, Binary Options Software and everything Binary Options related on Binary Options Directory! The Relative Strength Index technical indicator (RSI) is a price-following oscillator which ranges between 0 and 100. When Wilder introduced the Relative Strength Index, he recommended to use a 14-day RSI. From then on, the 9-day and 25-day Relative Strength Index indicators have also gained popularity. A well-known method of analyzing the RSI is to search for a divergence in that the security is making a new high but the RSI is failing to exceed its previous high. This divergence is a sign of an impending reversal. If the Relative Strength Index then turns down and falls below its most recent trough, we are talking about a completed "failure swing". The failure swing is treated as a confirmation of the impending reversal. Support and Resistance Levels: The RSI Shows - sometimes more clearly than the market price itself - levels of support and resistance. Divergences: As discussed above, divergences develop if the price makes a new high or low which is not confirmed by a new high or low in the RSI. The market price normally corrects and moves in the direction of the RSI. The first video shows you how to apply the RSI indicator on both Metatrader and JForex and what is the standard interpretation for the RSI.